“Positive” does not necessarily mean “warm fuzzies” or “touchy/feely.” It can also be interpreted in a mathematical sense. A positive number is one that is greater than zero. If I have five apples and someone stole four of them, I would still have a positive number even though something negative happened. From an economic perspective, positive means that the results produced from a course of action are greater than the resources invested. In psychology, positive means forward-moving growth and development for the individual. This is not always a “feel good,” rose-tinted experience. A key feature of happiness is engagement. We all know the experience of being detached, whether because of boredom, overwhelm, avoidance, etc. But when people are engaged, we are the best version of ourselves. How do you treat other people— family, coworkers, clients? What affect does it have on your work— effort, creativity, quality? Engagement may seem like it randomly comes and goes. We are learning that there are many factors that lead to engagement and it has the power to dramatically improve our communities. Some questions to consider: What does observing a classroom of engaged students look like vs. a classroom of detached students? What results do businesses produce when employees are engaged versus when they are unplugged? How do non-profits thrive when board members, funders and volunteers are engaged or stagnate when they are not? And can a leader be fully effective when he or she is disengaged? This line of questioning reveals something essential about people: Is there a way to increase our own engagement and that of others we can harness the power necessary to bring about meaningful results? We believe there is a way, and at the risk of oversimplification, it is this: we are engaged when we experience positive emotions and disengaged when we experienced negative emotions. 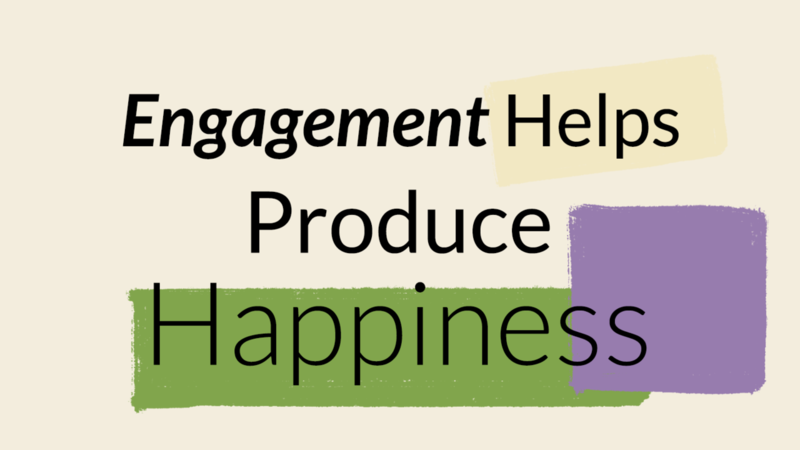 Engagement is essential when trying to produce happiness. There is an ever-growing body of research that affirms the benefits of engagement. You don’t need to look beyond your own personal experience of when you have been engaged compared to times that you were not. Consider for a moment your energy and happiness level during times you were highly engaged. What did it feel like? What factors contributed to your happiness in that moment? It is important to consider your engagement levels in your different environments to consider how you can increase your happiness.